Boneless Beef, Beef Broth, Potato Starch, Calcium Lactate, Tomato Paste, Monosodium Phosphate, Agar Agar, Salt, Chicory, Potassium Chloride, Lecithin, Calcium Carbonate, Choline Chloride, Betaine, Zinc Proteinate, Iron Proteinate, Niacin, Vitamin E Supplement, Thiamine Mononitrate, Copper Proteinate, Manganese Proteinate, Sodium Selenite, Calcium Pantothenate, Vitamin A Supplement, Riboflavin, Pyridoxine Hydrochloride, Biotin, Vitamin B12 Supplement, Calcium Iodate, Vitamin D3 Supplement, Folic Acid. 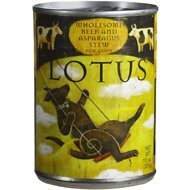 I bought this because I have a Morkie with horrible allergies and he can only eat beef. He likes it okay but half the can is gravy and for the price I was very disappointed. Will not buy again. This food was highly recommended so I bought a case. Expensive, yes, but my opinion is exercise and quality food are a priority with my 90 pound lab mix rescue. I make a lot of his food, but when I can't, LOTUS Beef Shank Stew is the next best option. I love the healthy ingredients, my dog loves the taste! Just ask my Coton De Tulear! Happiness. Health. Perfect skin. Good quality food. The delivery was quick and the price was better than local retailers. It is not sold at the local budget pet stores, just the higher end stores. Chewy was priced a little better and it saved me a trip to the store. I have an extremely picky Beagle, who essentially eats with her nose first and she loves this food! I have gone through so many different varieties of dog food in the past with her that I could open up my own pet food store! The Just Juicy Beef Shank Stew from Lotus is working for us nicely. 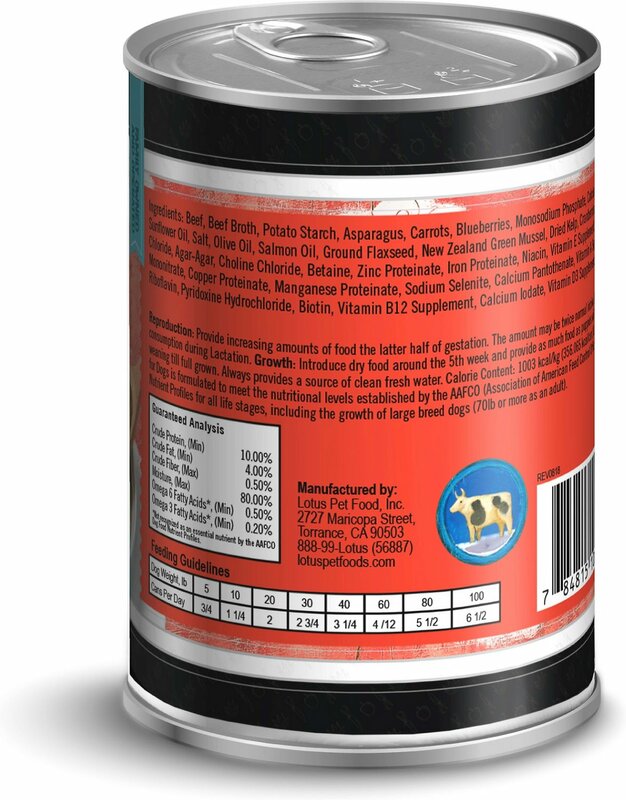 I like that it looks more appealing than other similar dog foods we have tried in this genre and that makes me feel good that she is getting a more premium food. The price is steep, but I cannot argue with the results. 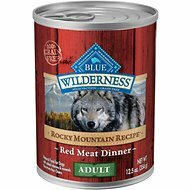 My dogs love this dog food!! They go crazy over it!!! My dog with colitis is actually looking better!! The beef shank is the least "soupy" of all their wet formulas. My two pups love the beefy gravy. They can smell the difference when it's not filled with carrageenan, guar gum or xanthan gum (comes out like a glob of glue, weird chewy texture). I shake the can well, then pop it into the fridge sideways. Becomes more dense for eating, less soggy kibble LOL. Their coats have this extra beautiful sheen to it, amazing Lotus quality! My dogs loved it. Wish it wasn't so expensive. 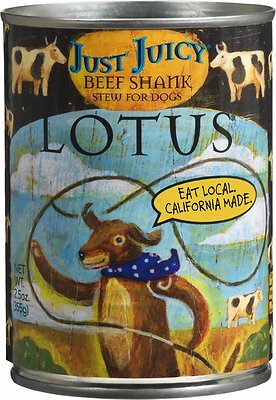 Ingredients are natural and dogs love it. Go right to my cabinet and wait until I can get can out! 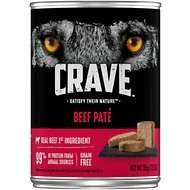 I got this as an infrequent treat food for my 3 cats because they like beef. Since dog food doesn't have Taurine in it, this will be a rare treat for them. I gave them their first treat tonight and boy did they love it. Unlike the Cat Just Juicy formulas, this is a very thick gravy. It's a deep rich brown, like people gravy. The beef is in small chunks that are very tender and I was able to smash them quite easily so the cats could eat them. This will definitely be a treat they all look forward to. My fussy little dog can't get enough of this food! He has stopped the constant licking that's often caused by food allergies. He's a happy fur-kid and I'm a happy mom!